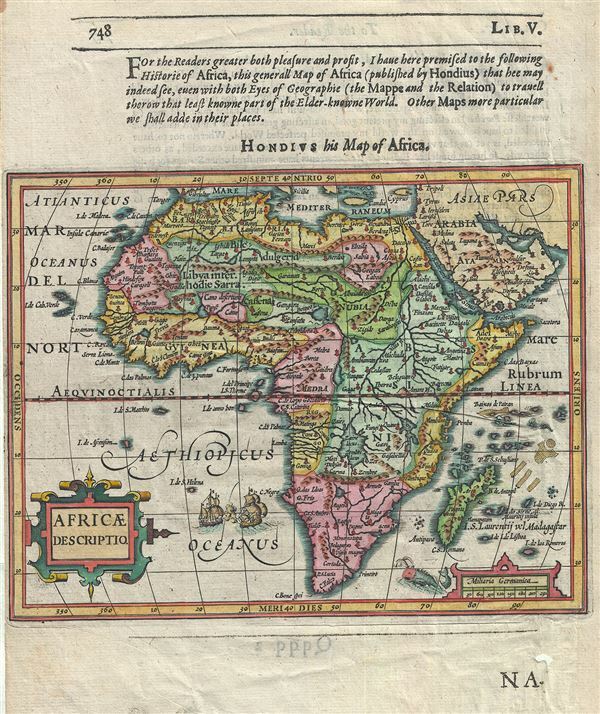 This is a beautiful 1625 map of Africa by the Dutch cartographer Jodocus Hondius. It depicts the continent of Africa from the early 17th century perspective. Largely based on earlier Mercator model, this map shows revised coastlines. The map also depicts various coastal features near Madagascar. The speculative details represented on this map also highlight how little was known about the region at the time. Beautiful illustrations adorn the map, including two ships in battle and a whale or a sea monster in the bottom right quadrant. This map is part of Samuel Purchas' Hakluytus Posthumus, or, Purchas his Pilgrimes, a compilation of voyages to foreign countries. Purchas, an English cleric acquired rights to use Hondius' plates to illustrate his works. University of Manchester Library, R1677. Betz, R., The Mapping of Africa A Cartobibliography of Printed Maps of the African Continent to 1700, #53.